Oh Catty, sweet catty. I so love your glossy pages with new crafting delights, eye catching photographs and promises of unexplored creative territory. 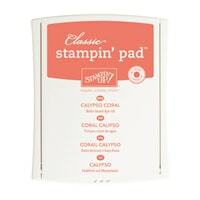 Stampin’ Up has done a phenominal job with their product catalogs. They are so much more than a list of products to buy; they are inspiration itself. Which is why this month we are CASEing our favorite projects. 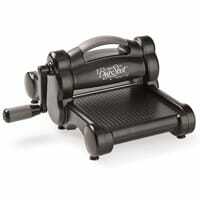 I’ll admit with SO MANY amazing products in the catalog, I passed over this gem a few times. Birthday Wit was an unexpected love for me. What finally did it was the way the “Happy Birthday” part of the sentement was cut out and popped up. This photograph got me thinking about an old Paper Pumpkin kit that had a similar feel and pattern and so I came up with these…. I swapped the square background for a circle and made the card a 3 1/2″ x 5″ instead of square. Each sentiment was stamped twice in different colors. One was cropped with a circle stitched framelit and the other was fussy cut. (My kind of fussy cutting by the way, straight lines!) Add a few background layers, pop up the cut out “Happy Birthday” with dimentionals and presto! a quick and cheery card with a slightly sarcastic disposition. I had so much fun making these cards that when I ran out of my leftover Paper Pumpkin bits I had to make another variation. This time I went a little bigger, 4 1/4″ x 5 1/2″, and added some glitz. The Foil Frenzy specialty designer series paper is fantastic for adding some wow to your projects. I mixed circles and squares on this design and set my squares a little off kilter like the catalog photo. Both the solid and foil layers are 3″ square. A touch of ribbon, a few rinestone accents and a doiley wrap up the design. My husband pointed out the irony of these cards saying, “These are so much more than ‘a piece of paper’ folded in half!” I’m a die hard crafter; of course my cards have to be more than a single piece of paper folded in half! Unlike most store bought cards……. hmmmm……. well played Stampin’ Up! Well played! Remeber that now through March 31st 2018 every $50 of product you spend gets you a FREE Sale-A-Bration gift! (Like that lovely ribbon I used on my cards above) SHOP NOW. Coloring with Sponge Daubers – quick and easy! I couldn’t be happier about the adult coloring fad. It was a favorite pastime as a child that I never grew out of. 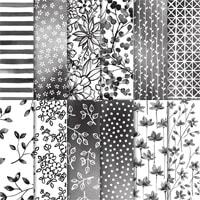 Stampin’ Up has several amazing line art designs perfect for any color enthusiast. The new Petal Palette suite is one such stamp set. As an added bonus, the images have an artsy, watercolor feel to them. They are not supposed to be perfectly solid or evenly colored. In addition to tradtional coloring methods, these soft focus images are perfect for the sponge dauber technique. Sponge daubers are great for getting color down quickly and are not meant for precision. They create a soft gradient of color depending on how much you layer the ink. Designed to fit over the tip of your finger, daubers are a cleaner, grown-up version of finger painting! Don’t worry about being messy when adding color with daubers! Since we are using dies to cut out our images it is okay to color outside the lines. I like to start dabbing color in the center of my image and work toward the edge. If you want a softer color concentration, try swiping the sponge instead of dabbing up and down. Most importantly: play around and have fun! Thank you for stopping by! I have a few last minute reminders before you go. Sale-A-Bration is going on now! Earn free gifts AND Compendium Credits with qualifying purchases. Sale-A-Bration is THE best time to join my team! Click here to sign up now! The 2018 Occaions Catalog is LIVE. Ahem. *cough* Right, where was I? Oh yes…. I’m on team “O” so my design project will not be featured this week but I’m playing along anyways! For this weeks’ challenge, I truly embraced the “challenge” aspect of our weekly creative inspiration. I intentionally choose three elements that are NOT in my usual bag of tricks. I learned an important lesson with this little exercise: inspiration can be found outside my comfort box. Easily, in fact. I think this card took me less time to design and make than most of my creations! I KNOW, right? I used the layering circles framelits to make a mask….like my last challenge card. I’m loving the masking technique! Next, cover the colored circle with the cutout and stamp over it. I used stamps from Gorgeous Grunge and Background Bits. My colors were So Saffron, Pacific Point, Pool Party and Delightful Dijon. Lift off circle cutout and stamp sentiment. Mine is from Colorful Seasons in Pacific Point. Ever since I saw this stamp set in the demonstrator sneak peak of the new catalog, I knew it would be at the top of my list. Well June 1st finally arrived and so did my big box of crafting yumminess – including this beautiful set. These stamps practically do all the work for you! 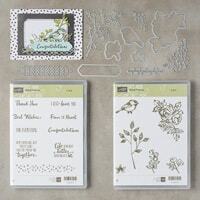 Stamp them on your favorite background cardstock, do a little coloring (use water color pencils and an aqua paint pen to really wow your friends) and send your greeting out the door. Stampin’ Up’s Floral Statements is a great stamp set to begin your watercoloring adventure. Click here to find out more about my special Floral Statements bundle available through the end of June 30th, 2017. Add your favorite color to the flowers! For an even simpler card, stamp directly on watercolor paper like these three cards! Large stamps, like Floral Statements, can take few stampings to get a good image. Stamp on scrap paper a few times first. Stamping on watercolor paper is finicky as well because of the rougher texture. If you can’t get the black lettering to stamp solid – cheat! I used a basic black watercoloring pencil on the “HELLO” letters. You are watercoloring anyways! This saves a lot of time – and paper – when trying to stamp on watercolor paper. The 2017-18 Anual Catalog is LIVE. You can find my specials and favorite products HERE. These special bundles are only available through June 30th. Welcome to my new segment, 15 minutes to Finish, where I show you quick, simple projects you can do in – you guessed it – 15 minutes or less. Time is money and I want to help you make the most of it! Speaking of money, let me introduce you to our first project…. This is both card and gift card holder in one. The Eastern Beauty stamp set made decorating the card a snap. Pick your colors; I used Mint Macaron, Cucumber Crush and Lemon Lime Twist. Lay the cardstock horizontally and score at 2″ and 5 1/2″. Your finished card will be 3 1/2 x 5. 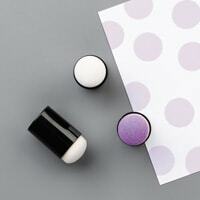 Use a 1″ circle punch on the 2 inch end of your cardstock to make a notch. I center my punch to make a half circle (ish). Fold and tape the edges of the 2″ flap. Your tape / glue should not exceed 1/2 inch wide along the edge….the pocket will end up too tight to slip the gift card in! Randomly stamp the card front with the largest circle stamp. I like to use the rule of three as odd numbers are typically more pleasing . Take some of the stamps off the edge of the card for more interest! Staplers – not just for the office! It may feel like cheating or shoddy craftsmanship, but in the right context a staple might be just what you need. This project is fresh, fun and a little funky. A staple was the perfect way to attach my little scrap of ribbon. Fast, secure and no futzing with fiddly bows! New Paper Pumpkin subscribers can get 25% off their first three months with the promo code STARTHERE. Click here for full details. Promotion ends June 10th!